Taking a vacation with kids can be a challenge, so keeping them busy and focused on fun is an absolute must. At Xcaret Park, there is so much to do, especially for the children. Take a look below at 10 different things your kids are going to love while at Xcaret Park. There are multiple places throughout Xcaret Park to see large sea turtles as well as baby sea turtles. And your kids will love the ability to see them up close. While this may sound weird, it’s truly a fascinating show. 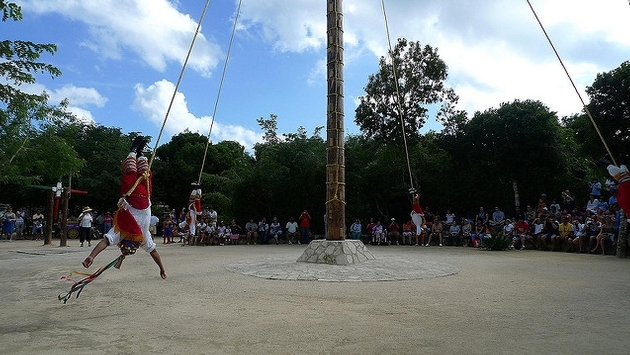 A ritual ceremony of the “Voladores”, men climb up a 98 foot pole and then fly around it as their bodies are attached to rope. Your kids definitely won’t forget this performance. Kids can hold the beautiful macaw bird as well as pet them and feed them. An interactive experience your kids will love! With fun colors and shapes, children will love diving into the buffet of great food. And be sure to get them a souvenir jaguar cup. As noted by the Xcaret blogger, there are “more than 5,000 marine organisms, including over 500 coral reef structures, sponge larvae, corals, jellyfish, and mollusks,” in the aquarium. Which means there’s plenty for the kids to ooh and awe over. Your kids will thoroughly enjoy cooling off with a dip in the turquoise colors of the Caribbean sea. The Butterfly Pavilion will captivate children with over 20 species to see. Every afternoon, a colorful parade with live music and lots of dancing called the “Desfile de los Pueblos“ takes place. Kids can put on paper masks and just let loose to the fun tunes. These majestic creatures can be seen in a couple different spots in Xcaret Park, but the true wonder is during the equestrian show, Xcaret Mexico Espectacular. And lastly, the rotating tower at 262 feet high will give you and your kids a sensational panoramic view of the Caribbean sea. For more information on kids activities at Xcaret Park, visit their website here.